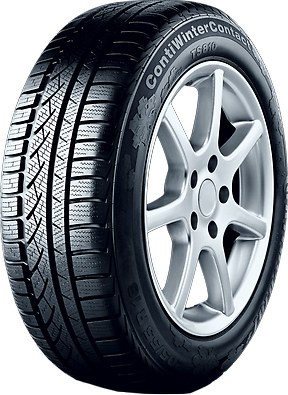 On the new ContiWinterContactTM TS 810, enhanced edge characteristics on the middle and inside of the tire significantly improve the grip on snow. In addition, the sipes of the asymmetrical tread pattern, which is an entirely new development, are 20% thicker on the inside of the tire.These sipes can take on much more snow and increase the traction due to greater snow-snow friction. New kind of sipe spacer. With a new type of wet polymer, the new ContiWinterContactTM TS 810 performs better in the wet without compromising its performance in snow. Ultra-active carbon black in the tire compound noticeably enhances the driving stability. Tire life and long-term flexibility of the tread could be increased by reactive plasticizers in the tyre compound. Tread for Optimum Wet-Road Handling. The customized tread concept ensures the good wet-grip performance of the new ContiWinterContactTM tyres. To reduce the risk of aquaplaning, the number of circumferential grooves that absorb water during rainy weather has been adapted to the tire width. The ContiWinterContact TS 810 has three grooves, or on widths of 225 mm and larger, four grooves. Throughout the tread on the tire there are several tread wear indicators that show the remaining tread depth. If the tread has worn down to 4 mm, thus reaching the limit for winter service, the TWI is even with the tread surface, clearly indicating the wear on the tire.